Earthquakes may last only seconds but they can shake up our lives for weeks and months to come. You can minimize your financial hardship by organizing important documents, strengthening your property and considering earthquake insurance. Most houses, apartment buildings, or commercial buildings are not as safe as they could be, especially if they are older. While building codes have been improved over time, few building codes require issues with older buildings to be fixed. Still, there are things that you can do to improve the structural integrity of your home or other building. Below are some of the most common issues. Others are listed on the menus at right (residential or commercial). Unreinforced masonry (URM). All masonry (brick or block walls) should be reinforced. Some communities may have a program for retrofitting buildings made of unreinforced masonry. If your house has masonry as a structural element consult a structural engineer to find what can be done. Inadequately braced chimneys are a more common problem. Consult a professional to determine if your chimney is safe. The Earthquake Country Alliance has created a guide on how to consult or a contractor or engineer when looking at retrofit projects for your home. Recommendations for what you can do to strengthen your home are also available from FEMA – Earthquake Safety at Home. Structures made of unenforced brick or block walls can collapse and cause great loss of life. Look under your home. 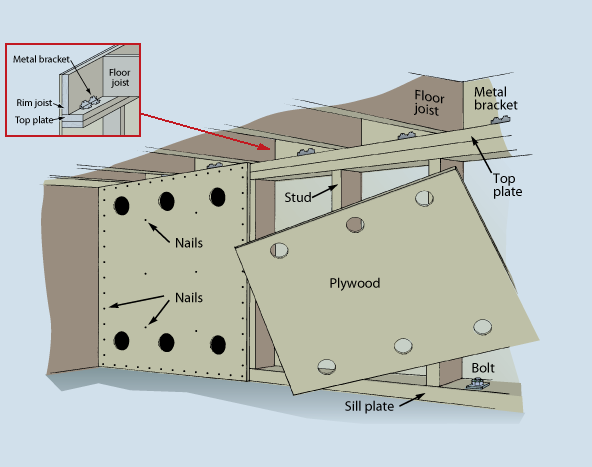 If you only see a metal or wood “skirt” on the outside with concrete blocks or steel tripods or jacks supporting your home, you need to have an “engineered tie-down system” or an “earthquake-resistant bracing system” (ERBS) installed. Renters and homeowners can protect themselves with earthquake insurance. Without earthquake insurance, you will be responsible for all costs to repair or rebuild your home and replace your personal property and in most cases, residential homeowner insurance policies do not cover earthquake damage. It is generally a separate policy you can purchase when buying homeowners insurance. The cost of the earthquake policy you are offered is based on a number of factors, including your home’s location, age, construction type, and value. It is up to each homeowner to consider their individual risk factors and then weigh the cost of earthquake coverage against the benefits that coverage may offer after a devastating earthquake. Many companies issue insurance policies, which are designed to rebuild your home if it suffers significant damage from an earthquake. However, the premiums, deductibles, and benefits vary depending on the insurer. Now that you are prepared to Minimize your Financial hardships, learn how to Drop, Cover, and Hold On during an Earthquake with Step 5.